CM11 Android 4.4 Kit Kat ROM for Galaxy Nexus! ~ AndroidRootz.com | Source for Android Rooting, ROMS, Tricks and More! 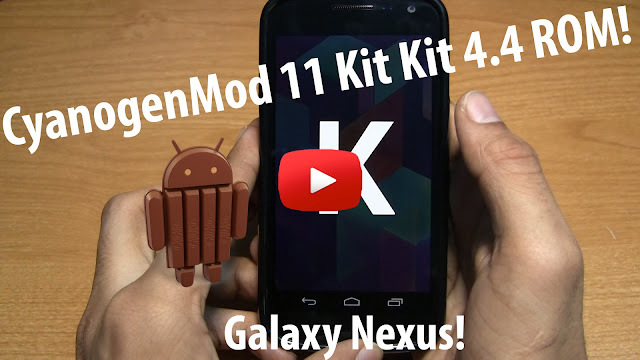 CM11 Android 4.4 Kit Kat ROM for Galaxy Nexus! Today we're taking a look at CyanogenMod 11 Android 4.4 Kit Kat ROM for the Galaxy Nexus GSM phone. You may be surprised that a Kit Kat 4.4 ROM is running on a Galaxy Nexus phone, a phone that Google stopped supporting after Jelly Bean. CyanogeMod 11 doesn't include any of the CyanogenMod features yet, but it includes the Google Experience Launcher (the launcher included on the Nexus 5) and and stable build that can be used as a daily driver. This ROM has almost everything fully functional like the WiFi, data, sound, etc. But, there are some minor issues such as the graphics when changing tabs on the web browser or changing from portrait to landscape, and Google Now seems to constantly crash. Note: Be sure to ONLY use the latest version of ClockworkMod recovery to install this Kit Kat ROM or any other Kit Kat ROM! Try out CyanogenMod 11 ROM for Galaxy Nexus and let us know how you like it!